A common Jamaican saying is, “tun dem han fi mek fashion” (hard translated as: turn your hand to make fashion; loosely translated as: use your hands in new ways to create a new style or fashion). This concept extends from cooking, to clothing, to way of life, but the main lesson inherited is that you use what you have to make things work. 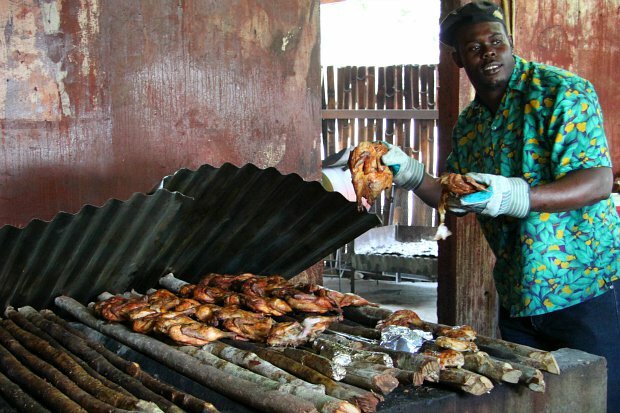 This lesson is apparent in one of Jamaica’s most celebrated dishes; jerk chicken. The main distinction between the jerk chicken found in Montego Bay versus the jerk chicken found in Jamaica, Queens isn’t necessarily the spices, but the cooking technique which involves one of Jamaica’s indigenous trees - the pimento tree (also known as the allspice tree). Pimento wood has been utilized for slow roasting in Jamaica for centuries. Historically, natives needed something that could burn very slowly and preserve meat. The pimento wood managed to not only burn slowly, but also produced a flavor that was incomparable to any other type of wood used. It became the standard and something that would give Jamaica its inimitable aroma. The salted ocean air is always laced with the distinctly sweet smell of burning pimento wood. This fragrance is infused within every breath you take. It curls across the island and dwells at the roadside jerk stops which attract both locals and tourists alike. At any time of day or night, you can find a long row of vendors, each with their own personalized, self-branded, homemade steel drums puffing spicy smoke halo’s above their heads. Each engaging passerby’s with their tempting selling spiels. “Jerk chicken! Bess jerk! Bess jerk pon di island!” they shout as they open the tops of their steel drums revealing the decadence within. The cloud of smoke escapes, and if the chicken glistens under the sun and leaves your taste buds curious enough, go ahead and point out the pieces you want. Some jerkers will cut the chicken into bite sized pieces on a cutting board made from the same pimento wood used to slow roast the chicken. The chicken is bundled within foil, but before the package is sealed, they allow you the chance to add some homemade scotch bonnet sauce or Grace Ketchup for added island character. The warm briny sea water. The crack of a fresh Red Stripe beer. These aromas bond with the spirit of Jamaica. They coil themselves within the fabric of your clothing and inhale themselves into the folds of your mind; and when you arrive back home they exhale as you flip the top of your suitcase. And for a brief moment, you are there on the side of the road, picking the most perfectly roasted pieces of jerk chicken and breathing in the essence of the island.